Well, Therapy seems to be going well for me. Yet, it feels like my therapist hardly cares about me. She knows that I am broke and semi-homeless at this moment in time. I also understand she has to help the other guys in the group. It just feels to me that she hardly wants to get to know me and really help me. It was nice the first time I saw her and it was one on one. 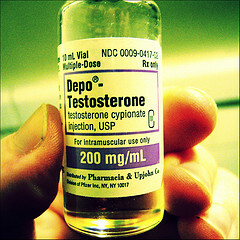 But she twisted my arm about wanting to go on to Testosterone. And stated to me; the way I took it, that she will only continue to see me if I do start on T.
I understand that artificial hormones for trans folk are great and dandy. But, with my family history of mental illness and all my past junk with my family that I have not been able to get through, I am just an emotional mess at the moment. As well as not wanting to lose my singing voice that the high power above gifted me with. As my Big Brother told me with his tattoos, it is an emotional evolution for an internal revolution. You have to get through all the emotional junk in your head first. Then be 110% sure that you wish to medically transition. Which in this point in time is hard for me to fathom, getting on hormones. Due to all the personal turmoil in my mind that I have not been able to release and fully conquered yet. Anyways…that is how I am feeling about hormones at the moment.